SPECULATION "Luminous beings are we, not this crude matter." Discussion in 'Star Wars: The Rise of Skywalker' started by Andrew Waples, Sep 5, 2018. So how far should they push Luke's Force ghost abilities? Combat? Or just enough for Kylo's redemption? Not sure how to put it more precisely, but I'd like him to do "something cool" as a Force ghost, but nothing crazy like actual combat. TLJ pushed it pretty far (Yoda summoning a lightning and hitting Luke on the head with his cane) which was great IMO. Anyway, they can't make it seem as if there's no difference between living and dead Luke, because that would undermine the ending of TLJ. Obi-Wan said "I shall become more powerful than you can possibly imagine" but I don't think it would work in a movie taken literally. Nah, we don't need every detail. Does the galaxy care? I’ll be honest, if “more powerful than you can possibly imagine” is reduced to another sword fight, I’ll be pretty disappointed. To me your thread title has significant relation to the question. When we think of power or combat, we generally tend to think in "crude matter" understanding. How many fireballs can you throw, how many physical swords can you wield, how many enemies can you physically cut down? But if we think about it from a "luminous" understanding, words are the power and the weapons. What those words convey. How they help a person to grow into understanding. Crude matter combat is like a crude analogue of luminous combat. Crude matter combat kills Kylo Ren and Ben Solo along with him. But luminous combat kills Kylo Ren and revives Ben Solo. To me, true power; "luminous" power, is not in the ability to harm but in the ability to heal. So if it were me, that would be where I push Luke's abilities. That is the "power" that the dark side cannot "possibly imagine" - it's not that it's turning the volume up to eleven; it's that it's on an entirely different plane of comprehension. Like, the light that shines in the darkness, but the darkness cannot comprehend it. It's not that it's "crude matter x1000"; but that it's "luminous" - it's beyond their very nature to be able to perceive and understand. In the end it's the power to redeem the lost by helping them to grow into understanding. That power is infinitely great than the power to strike someone down with a saber and claim victory. But, this isn't to say this can't be done in some, spectacular fashion - but really, it's humble in appearance when you strip away the spectacle. It's even perhaps a simple thing. Probably not, but it's going to be relevant to the plot, because he at least he is in 9 and not some item he owned. They way I see it, Force Ghosts seems to be attuned to certain people or places (I assume here that Yoda could Force Lightning the Temple Tree only because he was in tune with the power of the Jedi temple site), so I'd be happy with Luke tilting the scale somehow in a Force nexus kind of location. It would not be cool, IMHO, if Force Ghosts can suddenly cause lightning strikes wherever they go; that'd be too much, I think. Perhaps FG-Luke could help activate some Yavin temple mechanations or some sort, or cause a statue to fall over to crush some badies, or whatever. Like, the light that shines in the darkness, but the darkness cannot comprehend it. I.
I agree. If they can fight or cause lightning strikes whenever they want... then ep. v and vi may very well be pointless. That is only to say, it may become a silly plot device. Personally I’d love if the Yoda’s arc from TCW will be referenced and explored in the movies saga. Sure those episodes work as a backstory when it comes to the force ghosts. But there’s more than that, suggested. According to Qui Gon Jin, Yoda and therefore the others ( Obi Wan etc...) were “chosen”. There was a task for them. But if so... sure we know what happened, but we don’t know Why. Especially if we consider that by that time - when Yoda first goes to Dagobha etc... - Luke is not even born or conceived. But for some reasons some Jedi were chosen to learn how to guide Luke after their own death. I’d love to know if and why there was a “Force plan” all along the entire saga as those episodes seem to suggest. Or if somehow there was an invisible hand fixing things all along the events we see happening in the saga. The idea that some places and/or the force ghosts may be more than we originally believed it’s interesting. You can address this stuff, explore it further and tie everything without being silly and more importantly without changing the sequence of events and the lore, but just adding cool details. 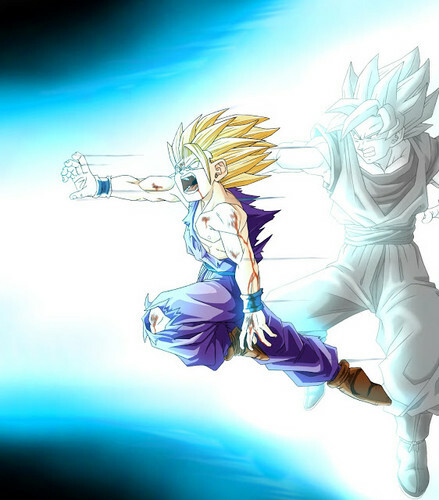 One of the greatest moments in the DBZ history and yes, this would be cool! We could also hear Luke's voice saying: "Use the force, Rey/Ben." That would be a nice call back to ANH. But I actually don't want to see Luke take part in a battle. He should be there for Kylo. => Haunting and trolling his nephew. My take on force ghosts is that they are part of the force and that only force sensitive people, possibly Jedi-only (or someone else with specific training), can interact with them. And, vice versa. My interpretation of Obi-Wan saying he will be "more powerful than Vader could imagine if he strikes him down" is that Obi-Wan achieved a training level that allowed him to communicate and guide other force sensitive people (in the particular case Luke), anywhere at any time. Obi-Wan was an old man, he even said that he was "too old for that sort of thing", but he had a purpose and mission, which was to watch over Luke and lead him in the path of the Jedi. He achieved his goal in the normal world and then he behaved the way he thought was more effective to buy time for their friends in the DS and when the time was right, when he confronted Vader, he could go in peace and achieve another state of conscious, arguably more powerful, not in a physical direct sense, but one where he could manipulate the galaxy events through other Jedi at will at any time. So, more powerful must be interpreted in a certain point of view, one where Obi-Wan had fulfilled his mission and was now ready to join with the force and be omnipresent to give very important guidance to the "new hope" for the galaxy, namely Luke. As for Yoda's "LUMINOUS BEINGS ARE WE, NOT THIS CRUDE MATTER. ", it's him saying that the Jedi, or force-sensitive trained people, are people who are in tune with the force, and therefore are more powerful and enlightened. Yoda, like anyone else living in the galaxy, were made of "crude matter", but he and other force-sensitive people were more than that. They were luminous beings, beyond just the crude matter. So, what about the lightning and other physical manifestations in TLJ done by Yoda? Well, Obi-Wan did sit in the log in VI. So, there seems to be some level of physical interaction of force ghosts in the normal-physical world. So, the stick hitting luke isn't a big deal. As for the lightning, now that's powerful. However, they were in a particular place, which was very attuned with the force, if not one of strongest. So, it's not so much of a stretch to imagine that that could have allowed Yoda to summon a lightning in that particular environment. In my view we shouldn't interpret force ghosts and what they say too literally but more in the sense that they are another form of "after death" conscious that has limited abilities in the normal-physical world, which will depend on intensity depending on the level the force-sensitive person has achieved. And, they have far reaching, possibly ever-lasting presence in the universe, and can influence other force-sensitive people at any time of their choosing, as long as the force keeps existing. In a way they are like guides, the invisible hand of the Universe. And only force-sensitive people with proper training can achieve that and be able to communicate with other force-sensitive people after death. In a way it's like "cheating death", but the Jedi way. It's the "letting go" way. While the Sith, and other dark side interpretations are more literal in the sense of wanting to say alive forever in the normal-physical world, which does not seem to be the natural thing, or the will of the force. I'd love that too... especially taking into account the "see you around kid" quote. going as he believed they would have gone, once he became the new Supreme Leader. That coupled with Kylo/Ben paranoia and inner insecurity could be glorious to see. And from this pov, Luke may be hunting Ben/Kylo not because that - hunting - is his method. But becasue that is how Kylo/Ben will react. He will feel "hunted". They may even play with the idea that Kylo/Ben doesn't believe that is his uncle force ghost for real but only his mind failing him. Especially if he only sees Luke's ghost and not that of his grandfather. He surely hasn't see Anakin's force ghost until now. as to why he believed Luke lied to him on this matter. That his "family", the chosen one blood had another task... whatever it may be. Agreed. We don't quite know why Obi-Wan couldn't help Luke in confronting Vader, but it was possibly due to exactly who and when he could haunt Luke. Haunting Luke on the Force site of Dagobah was probably effortless, but in the Death Star trench (with Vader on Luke's tail) FG Kenobi could only say a couple of sentences (although, to be fair, he might have refrained form visually appearing before Luke as he sped onwards at a gazillion miles an hour down a narrow trench so as to not visually distract the young pilot). I think -- or rather, it makes most sense to me -- if the FG trick isn't unlimited in scope and power, if FGs can only haunt certain people at certain circumstances/times/places, and I would find it pretty cool if FG-ing in the presence of a Dark Side master like Vader was metaphysically impossible. (This might also hint, indirectly, towards why Yoda & Co. couldn't sense the Dark Side in Palpatine in the PT; the Light Side just don't work well in a Dark Siders precense). This might lead FG-Luke to have real trouble haunting Ben, allowing him only to offer gilmpses or scrambled sentences that Ben would routinely misunderstand/misinterpret, leaving FG-Luke with no other option than trusting Rey to bring Ben back to the light for him. That might be a pretty cool story arc for the trio to explore in Ep.IX. Agreed. We don't quite know why Obi-Wan couldn't help Luke in confronting Vader, but it was possibly due to exactly who and when he could haunt Luke. I don't think there is any Force ghost law saying that Obi-Wan couldn't interfere. I assumed it was because of his history with Anakin that he didn't want to interfere. I assumed it was because of his history with Anakin that he didn't want to interfere. I think the opposite. My take on it is that it wasn't a choice, but more a case of the Force wouldn't allow it. The dark side that surrounds Vader meant that Obi-Wan - or Yoda - just wouldn't be able to have any presence or influence in that situation. Vader's dark side presence cancels them out. Edit: Don't know why I added Yoda there. He still alive at that point! It’s an interesting thought ('cause I like broken/troubled characters) but I don’t quite buy it, at least not on the surface. I don’t buy that Obi-Wan would refuse to help Luke – whom he believes is “our only hope” – in the horrible task of confronting Vader. I believe Obi-Wan would do anything in his power to help Luke out if he could. Besides, Yoda never question Obi-Wan’s unwillingness to help, which he surly would if helping Luke in overcoming Vader and saving Luke’s friends – and indeed, to save the golden boy from being corrupted by Vader's darkness – was ever an option. No, when Obi-Wan says, “If you choose to face Vader, you will do it alone. I cannot interfere”, I believe he means it literally; he cannot – as in is metaphysically unable to – interfere! Now, I could buy Obi-Wan fearing that, should he help Luke in the task he might make things worse somehow, thereby foreshadowing Luke’s refusal to interfere with the state of affairs in TFA and most of TLJ, but if so I would expect the reason to be asserted in some way and for Yoda to either challenge or support Obi-Wan’s decision here. I think it is more likely, and more interesting, if one of the Dark Side’s side-effects/powers is that force users so powerful in the (presumably Light Side of the) Force that they can overcome death as Force Ghosts, are unable to FG haunt people & places strong in the Dark Side. And again, I think this would add some interesting background to why Palpatine could operate out in the open with no fear of his Dark Sidedness being discovered. I keep thinking that "if you strike me down, I shall become more powerful than you can possibly imagine" means more than talking, standing, sitting on a log, diverting a lightning strike and bonking you on the head with a cane. We have never seen anything that really makes that line hold true. I hope that changes with Luke in EP 9. I’m of the mind that maybe ‘Force ghosts’ are effectively the ‘Whills’ that Lucas talked about (in a way). They don’t directly affect the physical world, but they can influence it. They can push events toward a particular direction, but they can’t specifically ‘make’ them happen. TLJ sort of muddied that perspective up a bit, but I think it still stands. Obi-Wan transcended to a higher plain of existence. He became one with the Force - an energy field that surrounds all things and binds the whole galaxy together. Sounds pretty ‘powerful’ to me. Having that manifested as any sort of ‘combat’ just seems so small minded to me. Like inventing a cold-fusion reactor and using it to hard-boil an egg. I really like your interpretation, @eeprom Obi-Wan personality transcends the death of his body to "occupy" a portion of the Force as a Whills-entity. This is basically an alchemical wedding! I love it, and this is now my new head canon Thanks!